If you live in a suburban or urban setting near low lying areas that are subject to flooding, and you are mainly bothered by mosquitoes in the evening, the cause of your problem is probably floodwater mosquitoes, and not tiger mosquitoes. Floodwater species develop in early spring in woodland snowmelt pools and during the summer in woodland and open field rainwater pools or drainage ditches that hold water for a few weeks to months. A number of floodwater breeding species occur throughout the US and can cause serious annoyance around dusk. Some of the more common species are: the common floodwater mosquito (Aedes vexans), the woodland pool mosquito (Aedes canadensis), the striped floodwater mosquito (Aedes trivattatus), the dark rice-field mosquito (Psorophora columbiae), the common white footed mosquito (Psorophora ferox), the gallinipper (Psorophora ciliata), the common malaria mosquito (Anopheles quadrimaculatus), the southern house mosquito (Culex quinquefasciatus), the unbanded saltmarsh mosquito (Culex salinarius), the winter marsh mosquito (Culiseta inornata) and other species that do not have common names (Aedes atlanticus, Aedes infirmatus, or Psorophora ferox). The BG-Mosquitare with BG-Sweetscent lure is very effective in collecting the tiger mosquito (Aedes albopictus) and the dengue or yellow fever mosquito (Aedes aegypti). Carbon dioxide is a scientifically proven attractant that is routinely used by mosquito control professionals to enhance their mosquito surveillance efforts. So by adding CO2 as a supplemental attractant you can increase the variety of species and total number of mosquitoes that will be collected by the trap. In other words: Using CO2 allows you to target certain pest species (floodwater mosquitoes) that would otherwise be under-represented in your trap catch. The emission of carbon dioxide turns the BG-Mosquitaire into a trap for a wide range of mosquito species, including floodwater mosquitoes. It also further improves the catch rates for tiger and dengue or yellow fever mosquitoes. CO2 is an important attractant for all host seeking mosquitoes. BG-Sweetscent lure and CO2 work together as synergists and can help you to maximize the capture rate of your trap. Using CO2 can also increase your tiger mosquito collections. Using our CO2 upgrade set, you can add carbon dioxide as a supplemental attractant. The set allows you to connect a CO2 gas cylinder to a specialized emitter nozzle which is designed to optimize the dispersal of the gas. The amount of CO2 emitted can be adjusted according to the local and seasonal mosquito situation with the specialized pressure reducing regulator. We recommend a flow rate of 1.1 lbs (0.5 kg) /day (red marker on the display of the pressure regulator) for normal to high mosquito nuisance. The CO2 upgrade set comes with a special pressure reducing regulator that can be adjusted to optimize the catch rate to the local and seasonal mosquito situation. 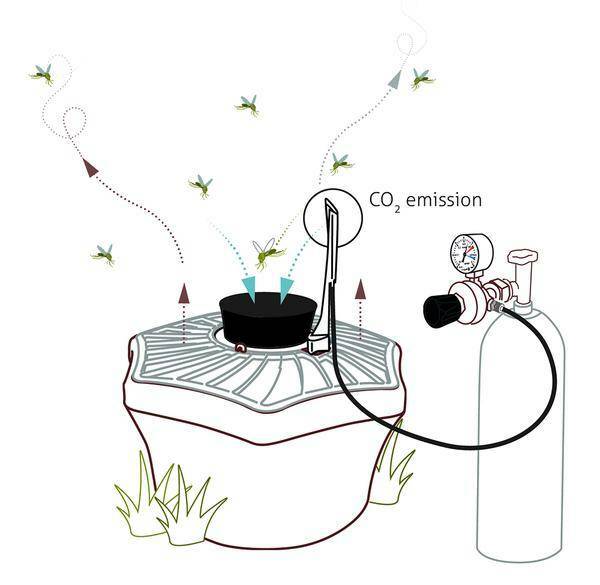 To most efficiently utilize CO2 with your trap, we recommend releasing the gas only at times of peak mosquito activity and shutting it off when mosquitoes are not flying as much. By releasing gas on a fixed schedule, you can greatly extend the time between refills. This can be accomplished either manually turning on and off the gas at the tank, or automatically using the BG CO2 timer. 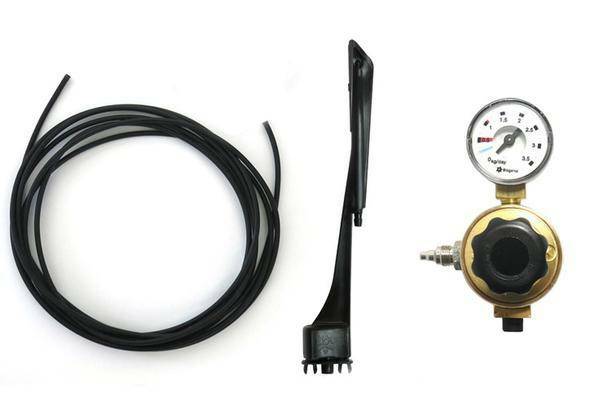 The timer connects between the gas manifold and the trap and uses a 9V battery-operated timer to can switch on and off your CO2 flow. You can program up to 2 distinct release intervals each day to correspond to dusk and dawn activity patterns. Our US webshop mosquitotraps.shop is now open! If you are located in the US, the CO2 upgrade set can be ordered fast and conveniently through the new US webshop. Benefit from shorter delivery times and lower shipping costs! In order to supply the trap with CO2, a commercially available 20 pound or larger CO2 gas cylinder is recommended. The CO2 gas cylinder is not included with the CO2 upgrade set. CO2 cylinders can be purchased online, from local compressed gas dealers or homebrew supply shops. Cylinders can be refilled at a number of locations including: compressed gas dealers, fire extinguisher service companies and paint ball supply dealers.